When you want to present a lot of information in a manner that your audience will easily understand, then an infographic is the best way to go. Information that will involve a lot of data, such as success stories and statistics should be placed in an infographic and not in the text. Infographics tell your readers what the best aspects of the products that you are selling are and how they stand to benefit from them. So how would you use these in your affiliate marketing strategy? Infographics bring about delightful changes to your marketing strategy. If there was a web page or blog post that resonated well with your readers, try and convert it into an attractive infographic. This is one way of re-energising your marketing efforts. Different people assimilate information in a variety of ways. Some people can read a blog post and understand the content while there are others who would prefer to skim through an infographic. 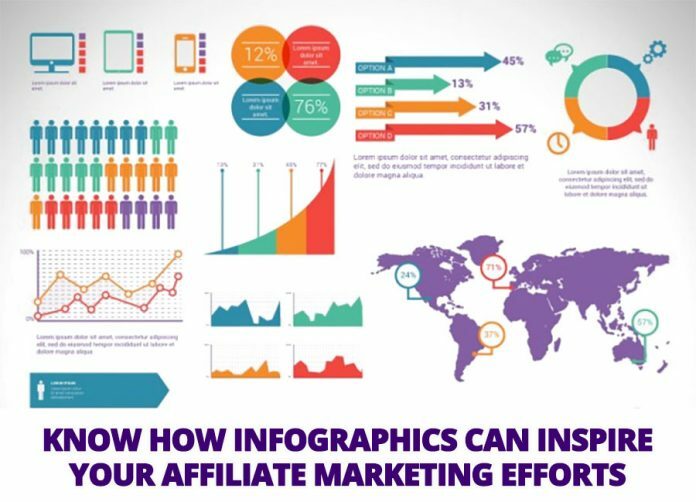 When it comes to affiliate marketing, an infographic can serve the purpose of rekindling interest in a product or service that you marketed in the past. You can put an embed code in an infographic, so other people can spread it around. The embed code will help bring more visitors to your blog or web page and increase your sales. Siege Media has an embed code generator that will help you add it to your infographic. You can now place testimonial quotes as part of an infographic. These quotes can be linked products and services that that testimonial is referring to. Once a new reader clicks on the testimonial, he or she is taken to your affiliate page for that product or service. Use infographics to bring data and statistics to your audience. When data is put in its text form, it tends to bore readers, who find it too involving. Infographics help put data and statistics in a manner that is palatable to readers. When people look at pictures depicting certain information groups, they understand it better than just reading the text. In affiliate marketing, this can be used to show sales of different products that you promote. Your audience would sometimes like to look at interesting aesthetically appealing infographics rather than read endless black words on a white page. When you colourfully put all this information, using pictures, your audience will respond better. This is a great way of telling the story of your products just to generate interest in potential customers. You may put the history of an electronic device from decades ago, lead your audience all the way down to the latest version ( which happens to be the one you are promoting) then ask them to make the purchase. Sometimes marketers use stories to get customers to buy the goods or services that they are promoting. Using an infographic will catch the eye of the customers, and probably make him or her, more willing to buy what you are promoting. You can promote your brand as well as a product by using colours unique to the product. If you are promoting popular cosmetic, then the colour scheme of the infographic and the fonts should be identical to the brand colours and text of the cosmetic you are selling. This way you get your customers to identify the products that you promote quickly. You can get to customers who usually look through infographic directories for information. They will comb through your infographic, and if they like it, they will end up coming to your sales page. Make sure your infographic fits the theme of the directory and that the directory is legitimate. Other places where you can post infographics include Instagram and Pinterest. These are sites will help you increase traffic as long as you post the infographic in the right category. People will respond better when they see that you have backlinks from respected websites. The only way to do this is to ensure that your infographics are powerful regarding design and the information contained therein. Infographics are a great way of letting your potential customers that you are serious in your affiliate marketing efforts. If your infographics are interesting and accurate, then you readers will share them with others, and this will increase your base of potential customers. This will lead to higher commissions when they complete their purchases, thanks to your beautiful infographics.